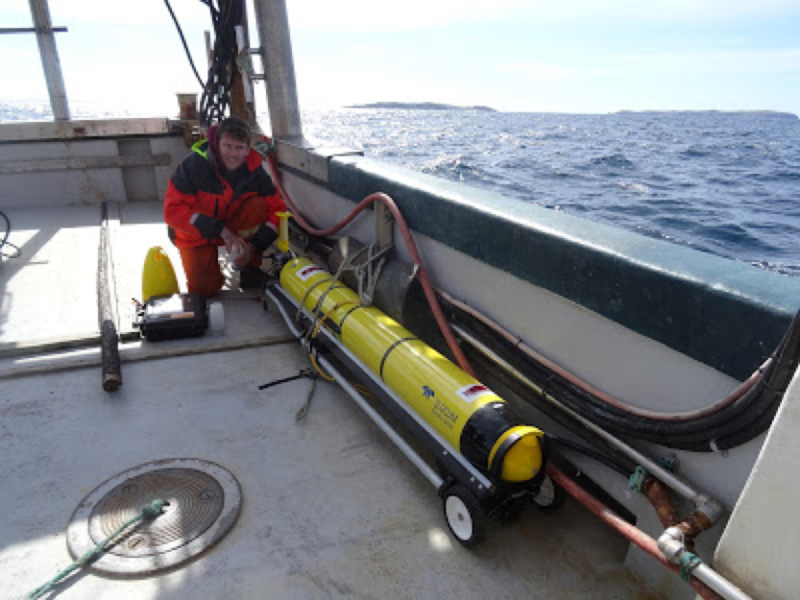 This fall we deployed an ocean glider into the Labrador Sea. Our goal was to make measurements of the oxygen and carbon dioxide gas properties in the Labrador Sea. There are presently two deep-sea moorings in the Labrador Sea, separated by about 40 km off the shelf in 3500m of water. 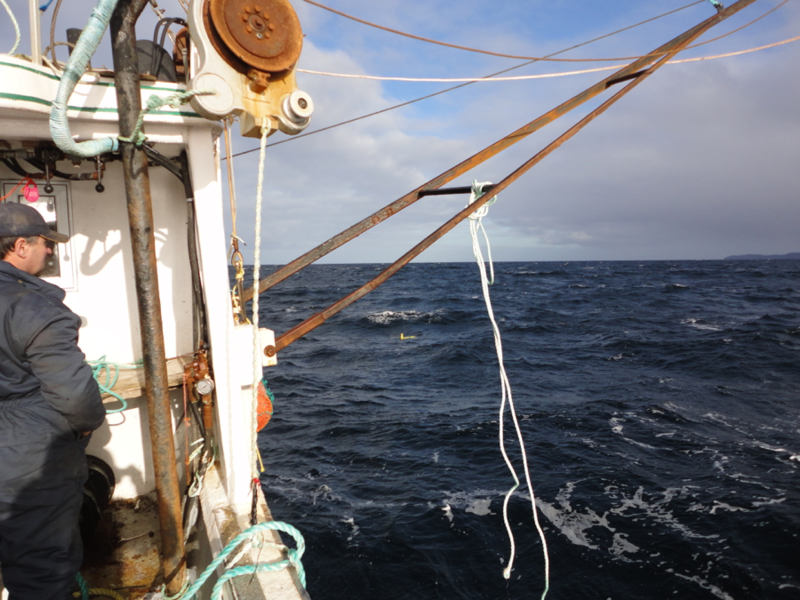 The K1 mooring was deployed by German researchers from GEOMAR in Kiel; the Seacycler mooring was deployed by Dalhousie researchers as part of the VITALS research program. We wanted to map the gas and water properties between and around the moorings. The glider operated from the surface down to 1000 m depth, flying along a 100 km extended line that connects the two moorings. Our original plan was to deploy the glider directly in the Labrador Sea from a research ship and then recover it from a ship in the Labrador Sea, so that we would get the most out of the batteries in the glider. Battery-power is time, and time is money of course. We wanted to get the most out of our battery investment. As it turned out, the availability of ships did not line up with our schedule. As a result we had to deploy from the shore in southern Labrador, the closest port to the Labrador Sea. For recovery, southern Labrador would not work because by December all the ports are closed because of ice. So we had to fly the glider to the south and recover from the island of Newfoundland. The deployment in September required driving 1400 km from our lab, in St. John’s Newfoundland, to Cartwright Labrador, about a day and a half of driving that requires taking a ferry from Newfoundland across the Labrador Straits to Labrador. We deployed the glider using a 63 foot boat operated by a local fisherman. Operating from small boats does have some advantages, making it easier to get the glider into the water. Even in September the weather was intense. On the afternoon of the deployment, winds over the shelf reached 55 knots and the sea was about 8 m or 25 feet. Mark Downey getting the glider ready for deployment with the Gannett Islands in the background. The glider did move across the shelf fairly smoothly (see below) although you can see from the track that there was a period when the glider was too shallow and got caught in a strong southward current and was pulled southwards. Once off the shelf and the glider could dive to its full 1000m depth thus was able to make better progress and only took a few weeks to reach the mooring stations. The glider operated in the Labrador Sea very well and flew for three months operating along the extended line between the two moorings. The intent was to fly the glider straight across the shelf but strong currents, and a little mixup in the depth of the glider, led to an unintended loop to the south. In November we began making plans for the recovery. We carefully watched the battery usage. Each day the glider would use about 0.5 percent of the battery. That meant that in principle we could have 200 days at sea but in practice we want to recover with 15-20% of the battery left in case there are delays on recovery or the battery is not as ‘full’ as we think it is. We made a plan to fly the glider along the shelf edge where the water is deep and where there is a strong shelf break current moving southwards. 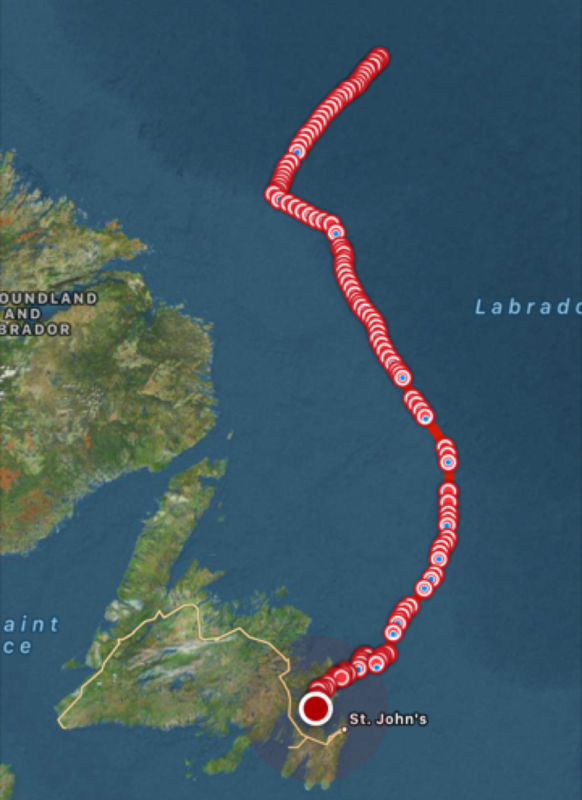 The southward current meant that we gained an extra 10-20 km of progress. We determined that it would take about 40 days to fly the return route and so headed the glider southwards in mid-November (see track below). As the track shows, the glider made its way southward very well in spite of a few hiccups. At times we would lose regular contact because the winds (greater than 50 knots – 80 km/hr) and sea-state (well above 10 m – 30 feet) were such that the antenna was not always working properly. We also had some problems bringing the glider back across the shelf when it appeared to lose track of its direction a bit, perhaps related to problems with how the glider corrects for the current that it experiences as it flies. 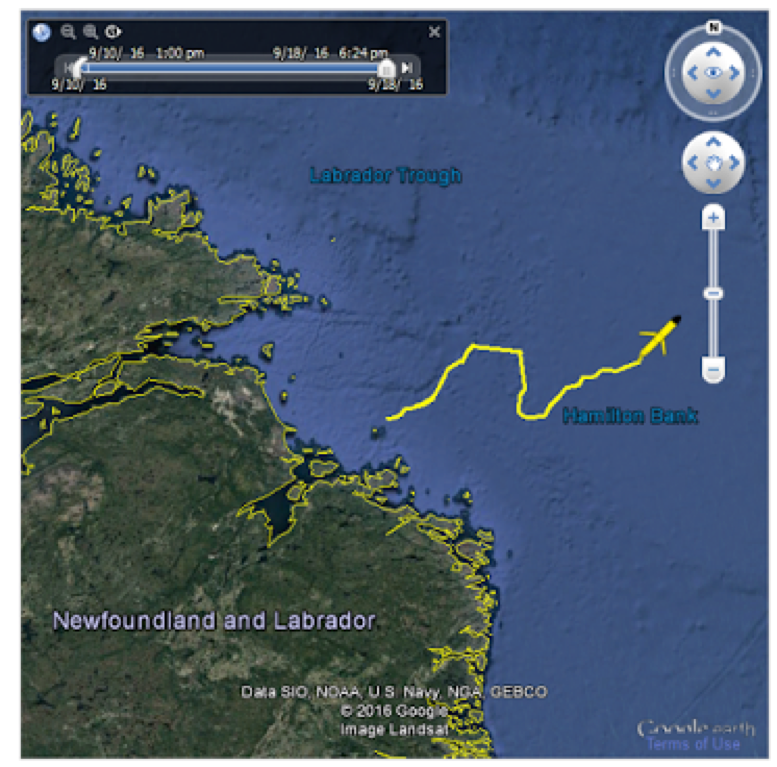 We planned to bring the glider back to one of the deep bays on the north coast of Newfoundland – Trinity Bay. These bays are somewhat sheltered and because they are deep the glider could wait there for us, patiently going back and forth in the deep water. The glider arrived at our target location off Heart’s Content, Newfoundland on Christmas day. We programmed it to fly a little triangle offshore (see figure) and then went out in a small boat to recover it. On the day of the recovery the pilot for our mission (Robin) was in the UK and so while he maintained contact with the glider we got the boat ready and then went out looking for the glider. The day before we had a storm with strong winds and the day after we had a strong winds again and so we had a narrow window for the recovery. It was winter and windy but we had no problems as we knew precisely where the glider was. The glider was just where we expected to find it and the weather cooperated. Now we get to explore the data and plan for our next deployment in the Labrador Sea. The glider (located just below the boom in the center of the picture) was just where we expected it to be on a somewhat windy and very cold data. The glider looked just as bright and clean as on its deployment some four months earlier.